inequality between the rich and the poor; widening income inequality in America. 3. Inequality is among the greatest of evils according to the Social Justice Warriors (SJWs) today. B. Why doesn't the Vatican take its vast riches and disperse them to the impoverished people of the world? 4. There are a few areas in which all men should be equal. A. All people should be treated equally before the law. B. All people should be equally not aggressed upon. C.	All people should be free to pursue their goals as long as they don't aggress upon others. II. Economic and social equality is an unattainable goal. 1. The grand goal of the social planners is to have a country (and a world) where everyone has equality, both socially and economically. A. This sounds nice, but it is unnatural, unbiblical, and unattainable. B. To attempt to implement it is immoral because it requires stealing wealth from one group and giving to another. 2. Economic inequality will NEVER be eliminated from this earth. A. Our Lord Jesus Christ taught that there will always be poor people on this earth (Mar 14:7). B. The same principle was taught in the law of Moses (Deu 15:11). C.	There have always been rich people, and there always will be. D.	God gives men power to get wealth (Deu 8:18). i.	Riches come from God (1Ch 29:12). ii. The blessing of the Lord makes men rich (Pro 10:22). iii. God gives us richly all things to enjoy (1Ti 6:17). iv. God even gives wealth to those who misuse it (Hos 2:8). v.	Therefore, if a person despises a rich man who earned his wealth honestly, he is really despising God who gave it to him. E.	There is nothing wrong with being rich. i.	Abraham was rich (Gen 13:2). ii. David was rich (1Ch 29:28). iii. Solomon was rich (1Ki 10:23). iv. These were godly men (despite their flaws), and they were nevertheless very rich. v.	Paul instructed rich Christians to be generous with their wealth (1Ti 6:17-19), but he did not condemn them for having it or tell them they didn't deserve it. 3. 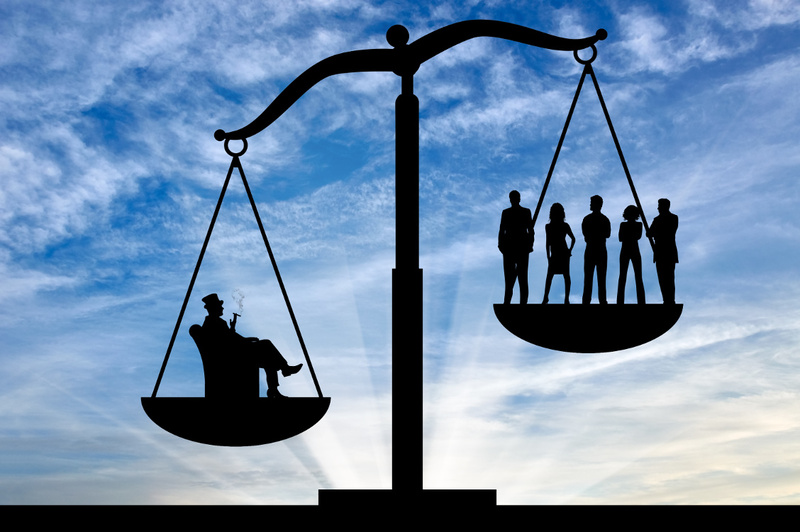 There are several reasons why economic inequality will never be eliminated. A. All human beings are born unequal in intelligence, beauty, size, strength, and abilities. B. This fact alone will naturally cause economic inequality among people. C.	IQ varies significantly by country, ethnicity, and climate which has an obvious correlation with national wealth. i. The following graphic came from IQ Research's website: https://iq-research.info/en/average-iq-by-country. iv. IQ varies greatly by "race". a. The following chart was taken from an article called Average IQ by Race, Ethnicity, and Career . . . And Why It Matters from AOTS written on 7-10-2017.
c.	IQs by race or nationality are only averages and don't necessarily apply to individuals of a nation or race. v.	IQ also seems to be correlated with climate: the hotter the climate, the lower the IQ. i. Some people are lazy, and lazy people usually are, and deserve to be, poor (Pro 10:4; Pro 19:15; Pro 20:4; Pro 20:13; Pro 24:30-34). ii. Some people are hard working and industrious, and such often are, and deserve to be, wealthy (Pro 10:4; Pro 13:4). iii. Some people are intemperate sinners, and such usually are, and deserve to be, poor (Pro 23:21). iv. Some people have strength of character and retain riches (Pro 11:16), while some are weak and have no self-control and lose it. v.	Some people are stupid and foolish with money, and foolish people usually are, and deserve to be, poor (Pro 13:18; Pro 13:23; Pro 21:20). vi. Some people are blessed to be born to wise and prudent parents who will leave them an inheritance (Pro 13:22; Pro 19:14), while others are not. vii. Some cultures place a greater value on education, hard work, and material wealth which will create economic inequality. a.	European and Southeast Asian immigrants to the US have much higher incomes than immigrants from Mexico, Central, South America, and Sub-Saharan Africa. b.	Racism cannot explain this disparity. c.	The following charts are from a Pew Research study which can be found here: http://www.pewhispanic.org/2017/05/03/facts-on-u-s-immigrants-current-data. viii. In some cultures, people marry in their late teens and have lots of children, but in others people remain single into their mid-30s before marrying and possibly having a child. a. For instance, Mexican immigrants marry much earlier than do Asian immigrants. b. This will also create economic inequality. c.	It's a good thing to marry young and have lots of children, but it will effect one's material wealth.